You'lll have loads of fun taking panfish, trout and other light tackle species with the Pflueger 4410U Microspin Ultralight Underspin Reel. 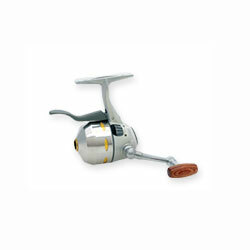 Not only is the Pflueger 4410U Reel an ultra-smooth caster, its stainless steel front cone and rear cover protect internal components for durability. "i love pflueger products and this is another but with all closed face reels you never know if it could get hung up"
"I've had this reel for about a year now and have used it maybe five times. It started out fine but eventually the reel started casting very poorly, and engaging in the middle of the cast. I will be returning this reel for another." "I used it on panfish in the south and was very surprised by it,s action i even cought some small bass on it"
"I recently purchased this reel for my young son. He has the fishing bug in a big way and wanted to get him a reel with some better quality than the cheap zebco 202's etc. We fish 1 or 2 times a week and he is starting to use lures and does a lot of casting. Well this reel constantly tangles up on the inside."